The prices quoted for Centre Court debenture seats include delivery and there are no hidden extra costs at point of sale. "Debenture" tickets are the only Wimbledon tennis tickets which may be transferred or purchased legally to watch tennis on Centre Court. All other Wimbledon tickets must be used by the original applicant. Compare Wimbledon tennis ticket prices with other companies offering similar tickets for Wimbledon. or email reservations@tennisboxoffice.com Buy your official Championship tennis tickets for Wimbledon from our pre-purchased stock of Centre Court seats. Your debenture seats will be adjacent. Up to 8 Centre Court Debenture seats can be supplied in a row. Centre Court Wimbledon tennis tickets from TennisBoxOffice are favourably price-checked with other Wimbledon ticket brokers, who offering similar debenture tickets to Wimbledon. We are one of the few brokers able to offer seating in blocks. To reserve your Wimbledon tennis tickets, simply click here and send us an email with your requirements. We will then reserve your Centre Court seats and invoice you by return email. Alternatively, call our Credit Card Hotline on +4420 8455 1972. Wimbledon debenture tickets offer an excellent view of the drama, as it unfolds on Centre Court. All Centre Court debenture tickets are situated in the first 14 rows of the Centre Court covered stand, (marked in yellow on the Centre Court plan, left). TennisBoxOffice can supply up to 8 Wimbledon tickets in a row on Centre Court for a group booking. Call our Credit Card Hotline +44 (0)20 8455 1972 or reserve your Wimbledon tennis tickets by email. "A quick thank you for all the care and attention you paid me when purchasing tickets for the mens final this year. It was my husbands 60th birthday present and we had a fabulous day. Thanks again." "We have just come home from the experience of a life time! It was a wonderful day at Wimbledon and my husband has had his best birthday ever. I wish to thank you for helping me arrange this for him! All the games we saw were really good and we will never forget this day! Thank you again for all your help." "We had an outstanding day at Wimbledon. We saw Serena and Rafa (5 setter) and Andy play from just 8 seats off from dead center court and just the right seats back so we didn't have to swing our heads back and forth. We enjoyed lunch at the Debenture club. Everything was perfect. London was the high point of our vacation. Thanks again." "I sent an email immediately upon arriving back in the US to tell you how much we enjoyed our visit. My husband and I said it was the neatest “event” that we had attended. Wimbledon was INCREDIBLE and the tickets we purchased through your organization were fantastic! The tickets arrived when promised upon our arrival in London and the debentures were well worth every penny. The debenture access to the private lounges meant not having to wait in the heat or long lines. Additionally, you didn’t have to leave the stadium because of the private lounges access. We were at Wimbledon on the historic day of the roof being closed for the first time ever which was amazing. Our seats were dead center and only a few rows back from the court with an unparalleled view of the players. We enjoyed the top matches on that court which included A. Murray, R. Federer, Soderling, plus the top seeded women’s match as well. It was an historic day and thanks to the roof the matches continued to late into the dark hours. We would highly recommend your organization for purchasing tickets and we definitely want to attend Wimbledon again. We are keeping all your contact information on file." Diane and Dennis P., Villa Hills, Kentucky,USA. "Wimbledon was quite an experience. My father couldn't have imagined a better 70th birthday gift, and I was so proud to take him to a Grandslam event. WOW. I promised pictures, and I never sent them. Please see the attachments: ashot of my father and me each day. Our friends Lisa and Brent B. are considering a trip over this summer. I hope you'll have the chance to work with them for tennis tickets. Please remember, I'm happy to serve as a USA reference for you." "Cary R. has asked me to contact you to thank you for your assistance with the tickets for Wimbledon. They had a marvelous visit to London and the tickets were perfect!" "Thank you for your very reliable service and the great seats! My son and I thoroughly enjoyed ourselves. The 2 1/2 hour rain delay did not prevent us from seeing a lot of great tennis on Centre Court and the Debenture Holders Lounge came in very handy during the delay. I must admit I was holding my breath at the possibility of seeing my large investment get washed out, but I'm glad you and we were able to enjoy seeing enough tennis on day 1 to make it all worthwhile. However, I probably won't take the risk and contact you again for tickets until Centre Court can be completely covered for play, rain or shine". "I wanted to thank you again for the tickets last summer. Anne and I had a wonderful time. I can’t thank you enough for the incredible seats – we loved them. While being on Centre Court was absolutely incredible, I think the highlight for me was getting to see Martina Navratilova play at Wimbledon. O.K. the streaker on Centre Court was cool too! What I really wanted to tell you is that if you needed a state-side reference please don’t hesitate to share my email or number. I’d be more than happy to share my experience with any prospective ticket buyer." "We cannot thank you and your team enough…. My parents had a FANTASTIC time! They were so impressed with the professional attitude of everyone as well as how friendly and approachable the staff and players were (John McEnroe & Pat Cash were a huge hit with my Mom!! ). Everything was made to be so easy and delightful for them. Please be sure to keep us on your mailing list for future events." Joanne. C.,New Canaan, Connecticut, USA. "This is our fifth year at Wimbledon and this was, by far, the best yet. Everything exceeded our expectations. The weather, of course, was perfect. The hospitality area, however, made the event special. I can't say enough for about the setting, food, drink and service. 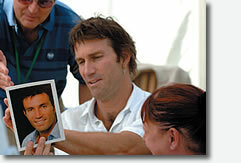 Pat Cash and Boris Becker spent a lot of time with our clients as well. Thanks. We are already looking forward to next year." "I just wanted to write and let you know that my wife and her friend had a wonderful day at Wimbledon when they attended your VIP hospitality event. The staff immediately put them at ease, the food and drink were excellent and the celebrities were charming. They even managed to fit in watching some tennis! Please pass on my thanks to all concerned." "My wife, Lynn, and her sister, Jane, want to thank you for securing excellent seats for today at Wimbledon. They said they had the perfect seating arrangement and enjoyed themselves immensely." "The seats were great, viewing from the side and being almost level with the net, gave a very good view of the play. The matches were of high quality, but a little one sided, particularly Federer and Henman. However, my wife thoroughly enjoyed her 70th birthday present and loved the whole atmosphere of Wimbledon, the Centre Court and the Debenture Lounge. In fact the whole trip went very smoothly and thank you for your part in that." will be most helpful.........If we ever have the chance to do this again, I would certainly use your service again." "Thank you so much for the tkts, everything was OK, the seats great and also the weather. We had a wonderful time. So I will try to contact you again next year to see the finals. Thanks again. "Thanks a million for all your advice and recommendations......for your outstanding support, help, and information that you passed on to me." "Many thanks for the splendid seats, right behind the Royal Box!! The weather co-operated, and we had a perfect day. If you need a reference in the US for others, just let me know." "Just to let you know my debenture tickets arrived safely. Thanks very much for getting tickets in Row A, much appreciated." "Just wanted to send a short note thanking you for arranging the tickets and VIP (luncheon) for Wimbledon. Your service was great, and the experience was wonderful. I hope we get a chance to come back, and if we do, I’m sure we will obtain our tickets through you again. Good luck in everything." Joanne C., New Canaan, Connecticut, USA. Wimbledon debenture tickets are excellent Wimbledon tickets! Each Centre Court debenture ticket comes with an individually numbered Debenture Holders' Lounge Badge, entitling the bearer entry into the Debenture holders' Lounge (exclusively for those with Debenture Wimbledon tickets). In 2018, Wimbledon debenture ticket holders will benefit from five recently developed restaurant and bar areas. Exclusively for the use of Centre Court debenture ticket holders they are built into the Centre Court complex. Centre Court now has a retractable roof, ensuring maximum play on each day of The Championships, even in the rain!